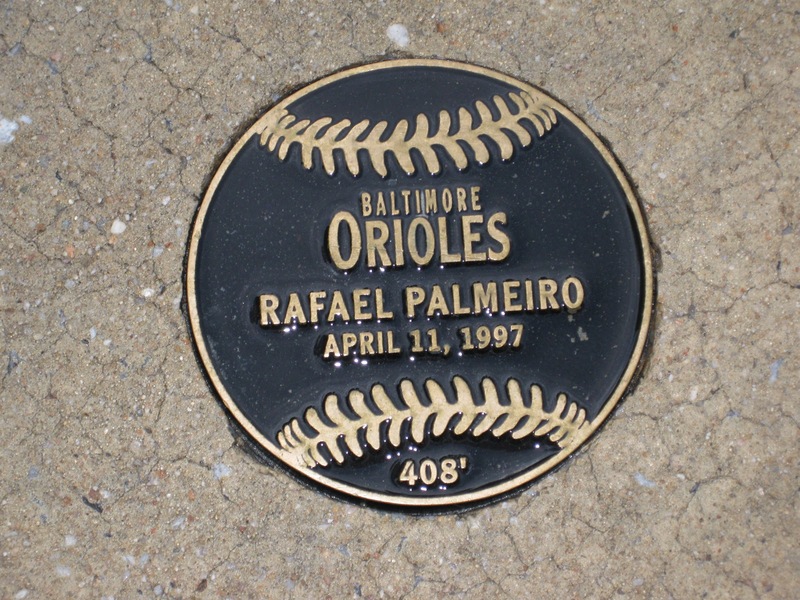 Rafael Palmeiro’s five Eutaw Street home runs are the most in the history of Oriole Park at Camden Yards. He got two of them in the same game on April 11, 1997. Palmeiro sent the baseballs a combined 819 feet, pushing the Orioles to a 9-3 victory over the Texas Rangers in the early stages of what became a wire-to-wire run for the Birds in the American League East. Palmeiro made a routine out of torturing his former employer, posting a .311/.428/.592 career slash line against the Rangers with 15 home runs and 45 RBI in 58 games. Nevertheless, he produced a series of unproductive at-bats early in this game: a double-play ball in the first inning, a strikeout leading off the third, and a ground ball that stranded two runners in the fourth. He returned to form in the seventh and eight innings by taking first-pitch offerings from lefties Eric Gunderson and Ed Vosberg out of the park. The late-innings binge left Palmeiro with three home runs in his last seven at-bats, all against lefties. His ninth-inning home run sent the team’s previous game at Kansas City into extra innings, where the Orioles won 4-2. Hitting coach Rick Down analyzed Palmeiro’s mismatched effort afterward in The Sun. If Palmeiro’s twin blasts attracted oohs and aahs, Mike Mussina’s seven-inning, three-hit effort on the mound drew sighs of relief from concerned Orioles fans. Just five days earlier, also against Texas, Mussina served up seven runs on six hits in four innings of work. This after allowing 11 runs in 16 innings in his final three Spring Training outings and skipping an Opening Day start due to bone chips in his elbow. The game also featured the home debut of Roberto Alomar, who served a five-game suspension to start the season for spitting on umpire John Hirschbeck the previous September. Like Mussina, Alomar had been limited by injury; a severe ankle sprain caused him to miss the last week of spring training. Alomar went 2-for-4 with an RBI and played highlight-quality defense, including fielding a second-inning grounder that passed through Palmeiro’s legs. “Robby was all over the field tonight, even though there are times when it seems like he can hardly move,” said Mussina. For his part, Palmeiro wasn’t concerned about where the spotlight shined. The visiting Rangers, managed by Orioles Hall of Famer Johnny Oates, started four former O’s players: Mike Devereaux, Mark McLemore, Damon Buford and Mickey Tettleton. Tettleton hit the first Eutaw Street home run five years earlier. 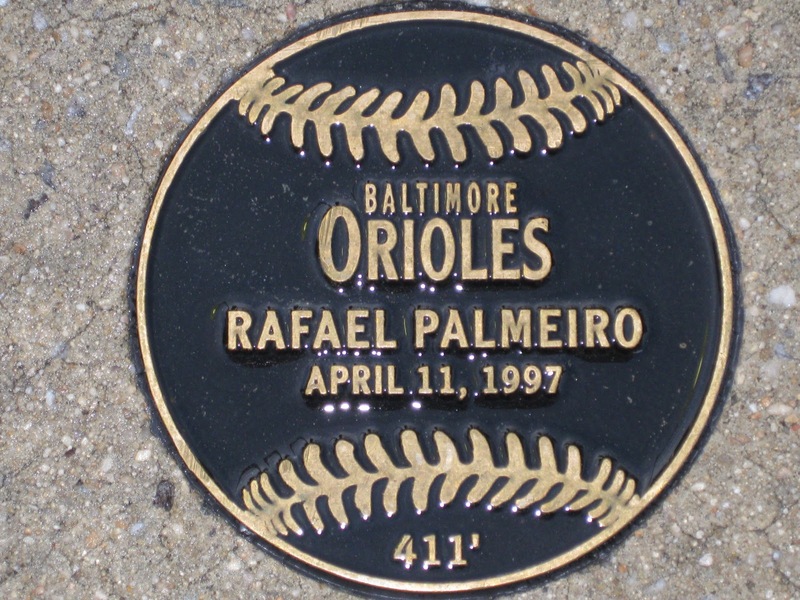 This entry was posted in Eutaw Street Chronicles and tagged Eutaw Street Home Runs. Bookmark the permalink.